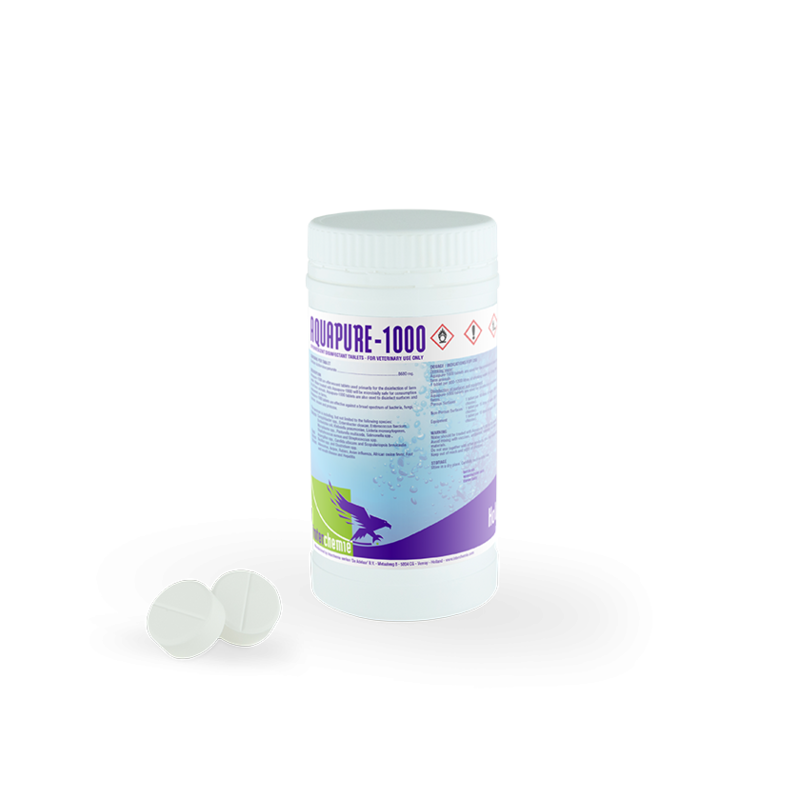 Aquapure-1000 are effervescent tablets used primarily for the disinfection of farm water. Water treated with Aquapure-1000 will be microbially safe for consumption by all farm animals. Drinking water: Aquapure-1000 tablets are used for the provision of clean, safe drinking water for farm animals. 1 tablet per 800-1200 litres of drinking water (4 - 6 mg/litre available chlorine). Disinfection of surfaces and equipment Aquapure-1000 tablets are used for disinfection of surfaces and equipment on farms. Porous surfaces 1 tablet per 10 litres of water (500 mg / litre available chlorine). Non-porous surfaces 1 tablet per 15 litres of water (350 mg / litre available chlorine). Equipment 1 tablet per 10 litres of water (500 mg / litre available chlorine). Water should be treated with Aquapure-1000 for 30 minutes prior to use.